7 schools in Offaly are completing their projects for the Junior Entrepreneur Programme. They’re part of more than 600 schools throughout the island of Ireland who have signed up for the programme which was co-founded by Tweak.com founder and entrepreneur CEO Jerry Kennelly. The free nationwide programme gives children between the ages of 11 and 12 years of age, a real insight to the business world, by enabling them to convert their commercial ideas into real business opportunities, complete with management teams, sales and especially the thrill of running a successful and profitable business. The free 14-week programme is led by Jerry Kennelly and supported by successful entrepreneurs across Ireland, including Sam McAuley, founder, McAuley Chemists, Frank Salmon (CMS Periperals), Peter Cosgrove, (ATA) and John Purdy (Ergo) among others. Over the last 9 years, 67,000 national school pupils have already benefited from the programme. 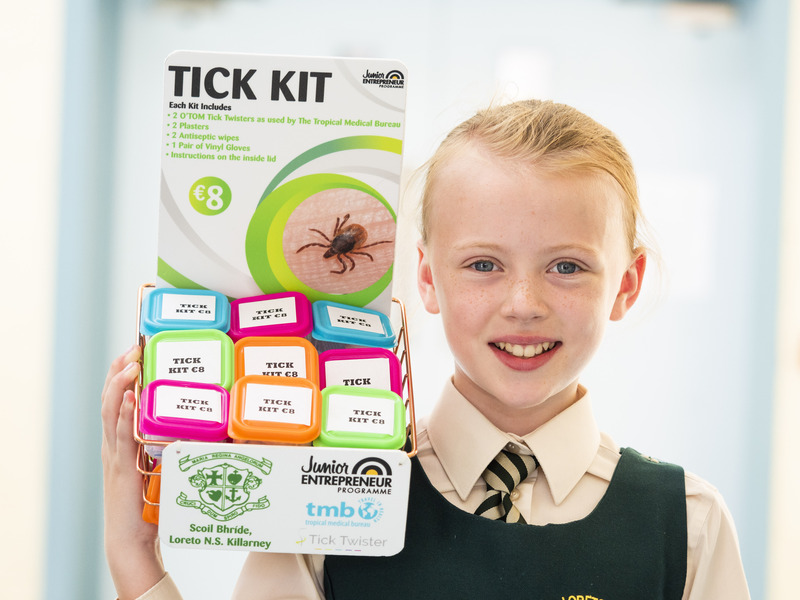 Amy Healy, a pupil at Scoil Bhrìde Scartlea, Muckross, Killarney pictured with Tick Kit which was created as part of their Junior Entrepreneur Programme project. The project achieved sales of €802 and a net profit of €569.90. “All too often entrepreneurship programmes target transition year students at second level, but by then many career decisions and subject choices have already been made. The ideal time to open young minds to the thrill of business is at primary education level, when they are at their most creative and uninhibited in their approach to business ideas and solutions” said Jerry Kennelly. The JEP programme is aligned with the primary school curriculum with JEP participants developing skills and confidence in presentation, drawing, technology, research, numeracy as well as problem solving, collaboration and brand awareness. A classroom and teacher kit is provided to schools free of charge, which includes the JEP Teacher’s Guide, posters, a school flag, pupil workbooks and classroom display. 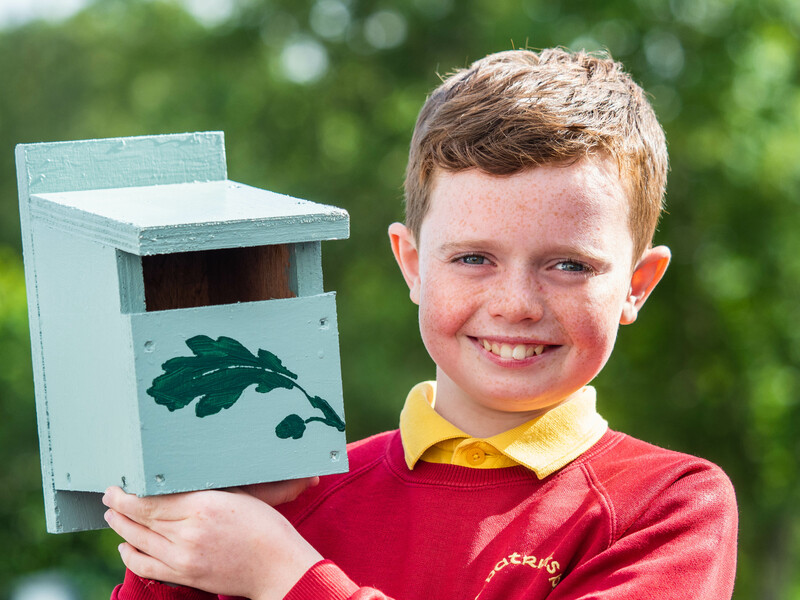 In a recent survey, primary school teachers said that the JEP programme supported subjects in the school curriculum ranking Maths & Science as the key subject supported, with English and Literacy Skills a very close second and SPHE, Visual Arts and ICT also being supported by the programme. Almost 90% (87%) of teachers saw an increase in confidence in children participating in JEP in their primary schools, with a further 66% stating that participating in the programme improved communication skills and the ability to work as a team. “The pupils participating in JEP have not only learned about business on the programme, but they have a far greater understanding of marketing, finance, sales and leadership and their presentation skills, teamwork and confidence increases significantly as a result of the Junior Entrepreneur Programme,” Jerry Kennelly continued. “National school is the ideal time to introduce children to the world of entrepreneurship – young children are creative and curious by nature, and these are just two of the skills required to be successful in business. Through JEP, we want to show kids just how much fun creating, working and succeeding in business can be” he added. JEP is a great opportunity for all school children. There is no cost to the schools and the benefits are enormous. It has been proven that pupils who participate in entrepreneurship programmes demonstrate increased initiative and self-confidence. Fostering a love for business and a culture of entrepreneurship in children will not only provide opportunities in the future, but will also support job creation and economic development in Ireland. Schools who participate in the programme are invited to exhibit at the JEP All Ireland Showcase event, now in its second year at the RDS in Dublin on May 20th 2019. More than 5,000 children are due to participate.